Well, 6 weeks after buying my Audi, she's finally been fixed up and good to go, after being stuffed around for weeks by some incompetent "specialists" who shall remain nameless, who wanted to charge $10-15,000 for a full engine rebuild - yeah right; fixed for a few hundred bucks by proper mechanics - a big shout-out to AUDI Spares in Oakleigh for doing a brilliant job diagnosing and fixing my cars problem! For the revheads out there, it's a 2004 Audi A4 Avant Quattro Turbo S-Line, quite a rare car to find. Has some nice modifications like RS6 18" wheels, Eisenmann exhaust, APR Stage 1+ tuning, upgraded fuel pump, blacked out grilles and Fulcrum suspension tuning. It'll be a useful car for moving stuff into our new house, plus for doing ski trips (not that there's any snow this year) and moving the dogs/bikes around etc - will keep it for a year or so and then look for something new again to play with! 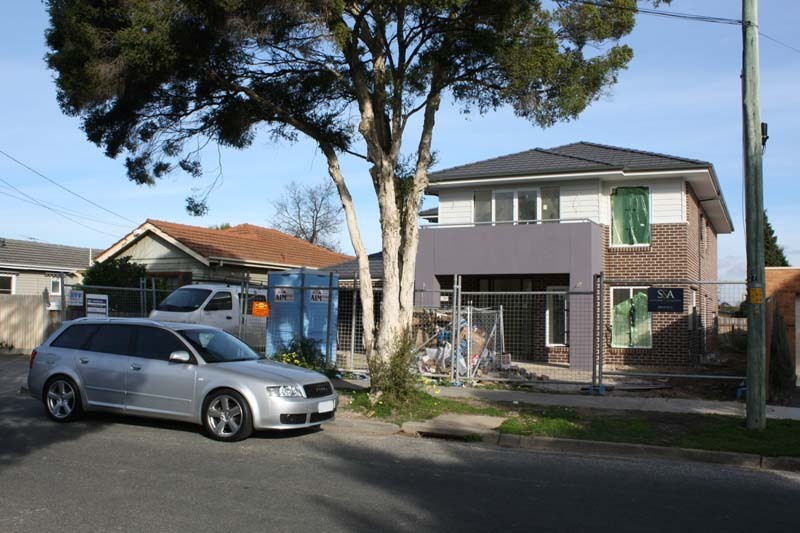 So, that van in the driveway in the photo above is the nice man from Premium coming in to install our shower screens and mirrors. Unfortunately the powder room mirror provided was totally the wrong size, so it'll mean another trip back to install that. Below: bathroom mirror installed. Makes the bathroom feel much bigger! 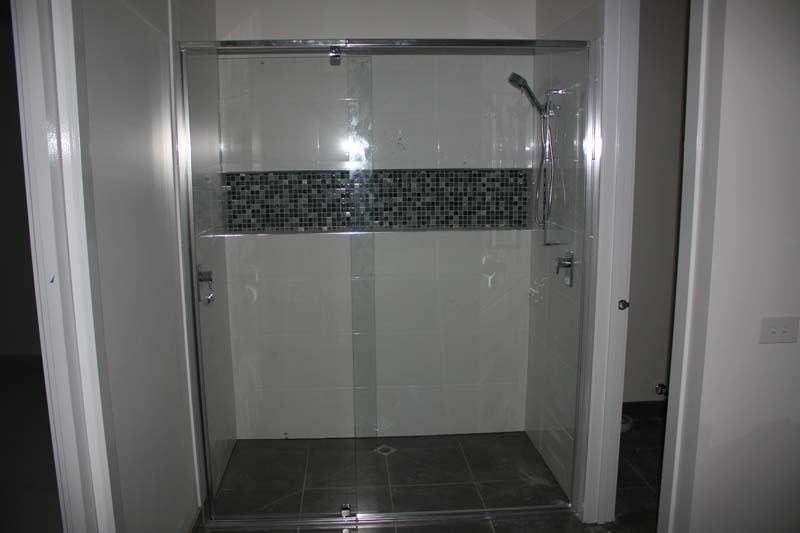 And next; bathroom shower screen. 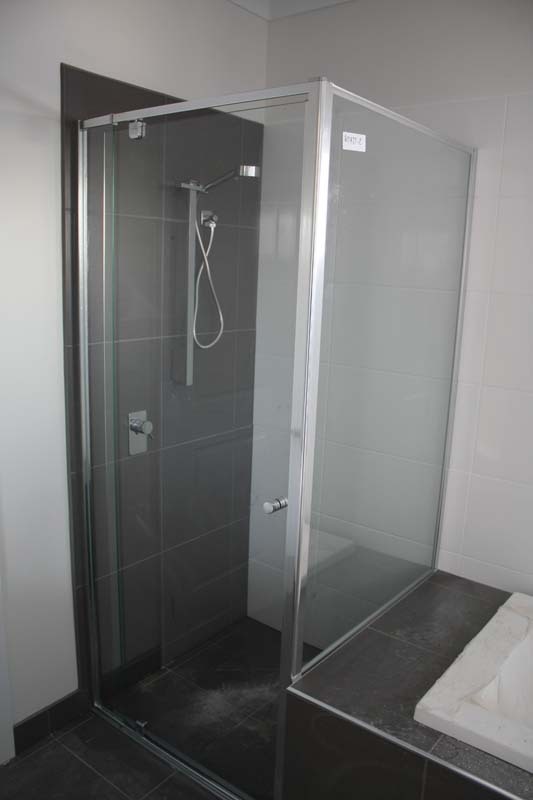 And ensuite shower screen. 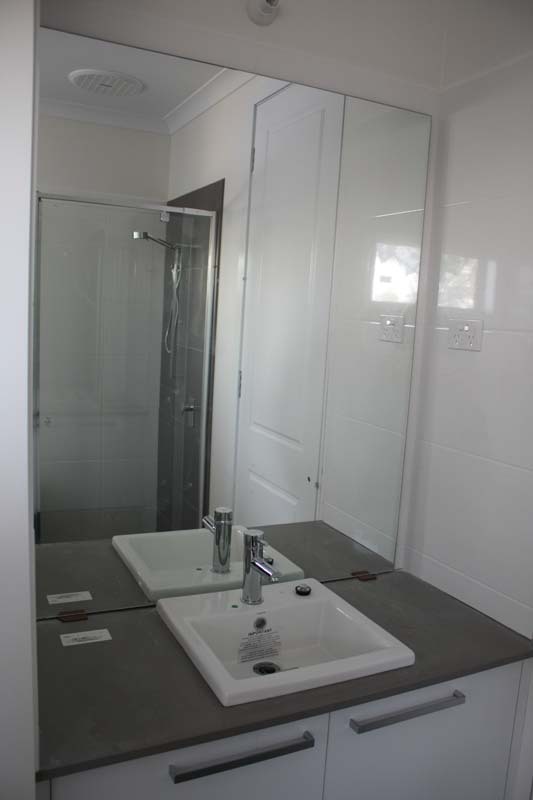 The pivot door is on the left. 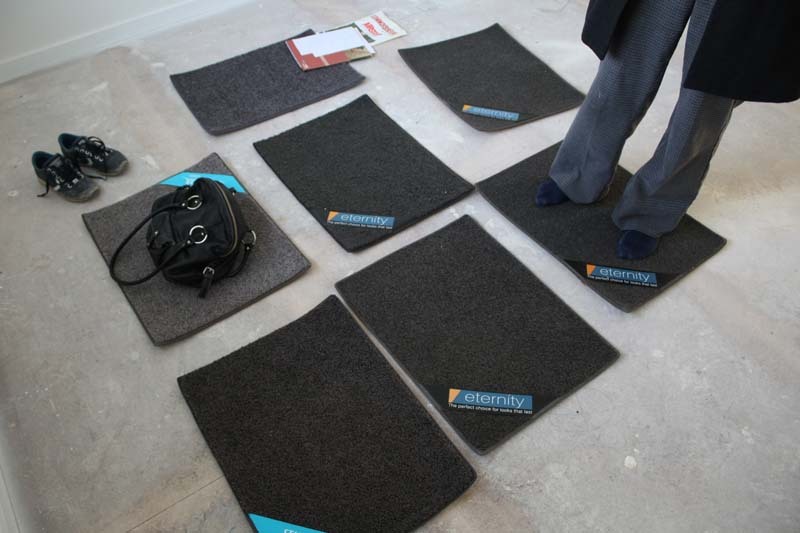 Also had a few more carpet samples to look at - they're all starting to blend in together. On Sunday we went to Fowles in Clayton, and got a very competitive quote on a Godfrey Hirst solution-dyed nylon, at about $155 per lineal metre installed with Dunlop Extreme underlay. There's a Carpet Choice near my work, and they're more towards $200 per lineal metre with Airstep underlay, but that's a good 25% more than the Fowles quote. Probably will settle on our carpet this week and place that order - it'll be a dark grey of some kind. Also in the last couple of days we've had our data/phone fitoffs. NOT happy - but will discuss in tomorrow's post. Hi Renee - we did speak briefly to the guy doing carpets at Studio M. He must be the worst salesman I've ever met - badly dressed, uninterested in helping us, managing to turn away to talk to someone else while we were talking to him! Frankly even if he'd given us carpet for $1 I wouldn't have bought it from that guy! You can find a bigger range at better prices doing it yourself anyway, which is what we're doing. Follow Us to get updates on new blog posts! Day 221: Hooray - things are being fixed! Day 210: Gearing up for the final stages! Slightly Off Topic: Who's a fan of Transformers? 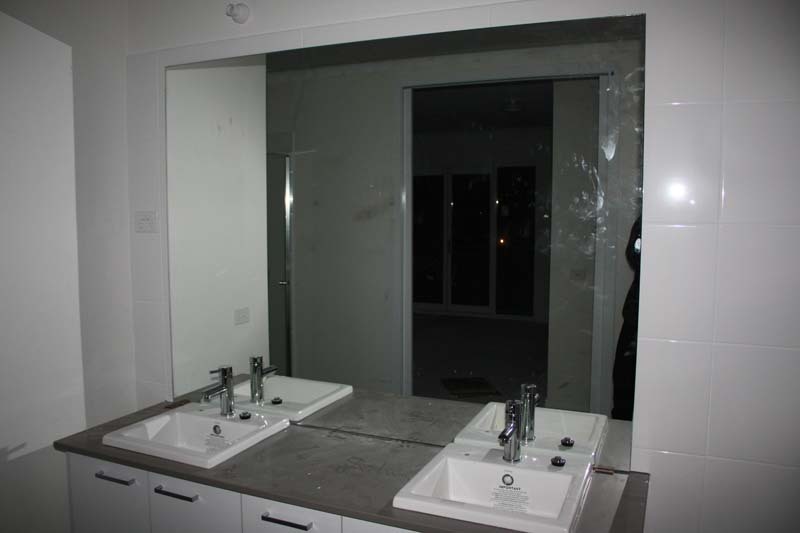 Day 203: Tiling, and benchtops! Day 199: Tiling, day 4! Day 193: Bad language warning ahead! Metricon Universal Info - Upgrade Pricing and more!